Is access to clean drinking water a basic human right, or a commodity that should be bought and sold like any other article of commerce? Stephanie Soechtig’s debut feature is an unflinching examination of the big business of bottled water. 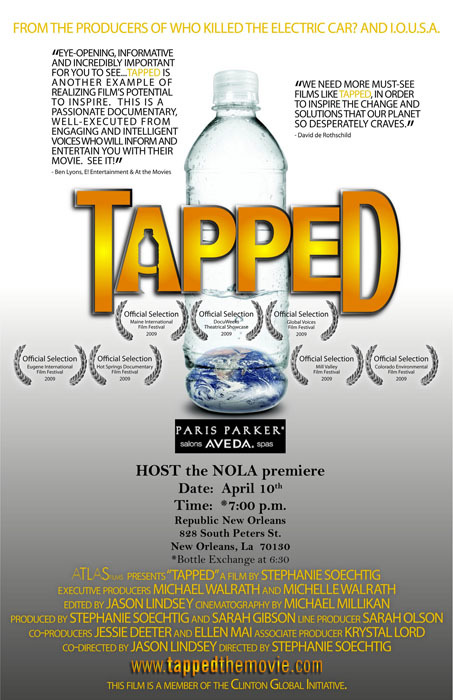 Tapped the Movie exposes the economic, social, and environmental realities of bottled water. There’s more to your bottled water than you might think. From the producers of Who Killed the Electric Car and I.O.U.S.A., this timely documentary is a behind-the-scenes look into the unregulated and unseen world of an industry that aims to privatize and sell back the one resource that ought never become a commodity: our water. A powerful portrait of the bottled water industry, this revelatory documentary shows people across the nation caught at the intersection of big business and the public’s right to water. This film will change your relationship with the water you drink.won’t be mutants. Well – maybe they will from ingesting so much plastic from the bottled water.